Brigadier General John M. Reynolds assumed command of the 93d Bombardment Wing on July 22, 1958. He replaced Colonel Paul K. Carlton who has been wing commander since Brigadier General William E. Eubank Jr. departed in June 1958 to take command of the 4310th Air Division in North Africa. John M. Reynolds was born in Cleveland, Ohio in 1911. After graduating from Murphy High School in Mobile, Alabama, in 1930, he entered Alabama Polytechnic Institute and graduated in 1934 with a bachelor of science degree in Aeronautical Engineering. He received his flight training in 1935 at Randolph and Kelly fields, San Antonio, Texas and served in the Army Air Corps as a flying cadet until October 1936, when he was commissioned a second lieutenant in the Regular Army Air Corps. His first assignment, after graduation, took him to Hamilton Air Force Base, California, where he had various squadron assignments including navigator, bombardier and aircraft commander of a combat crew. He wastransferred in November to the 24th Squadron, 23d Composite Group where he became squadron operations officer and held this position until November 1941. Upon subsequent reassignment, General Reynolds became squadron commander and operations officer with the 8th and l5th Reconnaissance squadrons respectively. He held these positions until April 1942, when he was assigned as plans, training and operations officer with the 3d Bombardment Command stationed at that time at MacDill Field, Florida. From there be was reassigned to the 9th Air Division, as division air operations officer, serving in the United Kingdom, Belgium and France from June 1944 until the end of the war in Europe. From May 1945 to June 1947, the colonel served as staff officer in the Operations Division of the War Department General Staff, Washington, D.C. He returned to the United Kingdom in July 1947, where he first attended the British Joint Service Staff College and later served as Air Force representative on a Joint Planning Staff. commander on 36 bombing missions on North Korean targets including bridges on the Yalu River. He returned to the Zone of Interior in October 1951 to become director of operations at Headquarters Second Air Force, Barksdale Air Force Base, Louisiana. He became commander of the 2nd Bomb Wing stationed at Hunter Air Force Base, Savannah, Georgia, February 1, 1952, and was promoted to Brigadier General in June 1953 while commanding that unit. In August of the same year, General Reynolds was transferred to Biggs Air Force Base, El Paso, Texas, and on Sept. 1, 1953, assumed command of the 810th Air Division, composed of the 95th Bombardment Wing (H),97th Bombardment Wing (M) and the 810th Air Base Group, and tenant organizations. General Reynolds, a rated command pilot, has been awarded the Legion of Merit; the Bronze Star Medal; the Distinguished Flying Cross; the Air Medal with three oak leaf clusters; the Asiatic-Middle East Medal; the World War II Victory Medal; the Korean Service Medal; the United Nations Service Medal; the American Campaign Medal; and the American Defense Medal. Hobbies Sports: Hunting, fishing, swimming, volleyball (prefers the outdoor sports, packs in to mountain areas for hunting). Swims and plays volleyball with two sons. Civic and Religious Evaluations Preferences as to food, clothing, housing, etc. The general says he likes anything in the food line. He prefers informal clothing off duty. Tastes in reading, music, art, travel, climate, scenery, etc. General Reynolds likes to read mysteries and biography for relaxation. His taste in music runs to soft, sweet, rythmic music. Guy Lombardo is still his favorite, and he also likes Lawrence Welk. He doesn't like rock and roll. His favorite television show is "Have Gun, Will Travel," and other Westerns. When it comes to travel, he says, "I've liked every place in the world I've been, but I believe Texas would be my favorite. Points or qualities emphasized or demanded, in dealing with others. Here is the general's code: "If a thing is worth doing, it is worth doing well. It is usually easier to do it the right way than the wrong way." And that's what I tell my people. Evaluations or comments by friends or associates. Not aware of any particular hardships or difficulties. Since he arrived at Castle Air Force Base, he has, in a very short time, endeared himself to the personnel by his fairness and obvious interest in his officers, men and dependents. A non-commissioned officer who has served under General Reynolds for the past eight years said, "You can't beat him. He's one of the finest officers and gentlemen I've over known in my years of service." Incidentally, Mrs. Reynolds also is tremendously popular with the wives on the base. One wife said, "She combines the natural dignity of a general' s lady with a warm, human interest in you, your family and your problems, It's a rare quality. 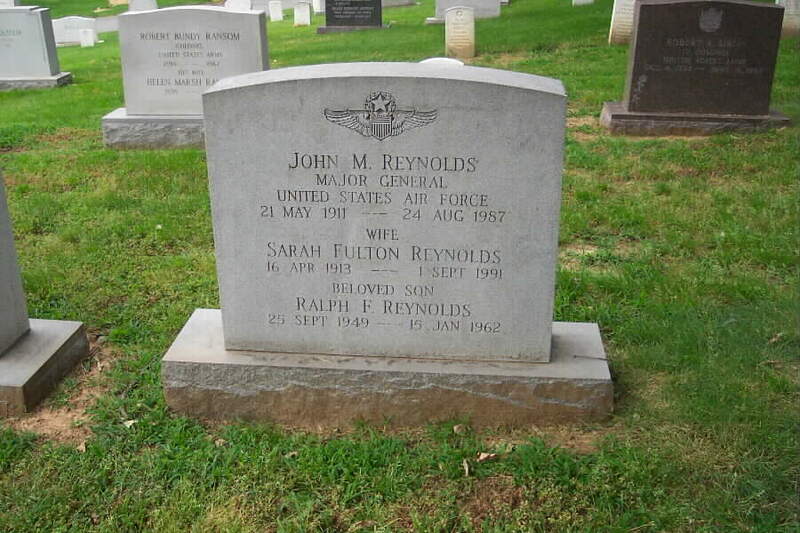 General Reynolds was buried with full military honors in Section 30 of Arlington National Cemetery. Buried with him are his wife, Sarah Fulton Reynolds (16 April 1913-1September 1991) and his son, Ralph F. Reynolds (25 September 1949-15 January 1962).